the division of a year into four seasons 一年を四季に分けること. 【植物, 植物学】 (植物分類上の)門 (cf. classification 1b). 可算名詞 [集合的に] 【陸軍】 師団; 【海軍】 分(艦)隊 《★【用法】 集合体と考える時には単数，構成要素を考える時には複数扱い; ⇒army 2》. 不可算名詞 [また a division] 不一致，不和; (意見などの)分裂 〔of〕. There was a division of opinion on the matter. その件に関して意見が分かれた. There will be a division on the motion tomorrow. その動議の採決は明日行なわれるだろう. 不可算名詞 【数学】 除法，割り算 《★【解説】 8÷4＝2 の時，8 を dividend (被除数), 4 を divisor (除数), 2 を quotient(商)という》. long [short] division 長[短]除法 《13 以上[12 以下]で割る》. The mountain range forms the division between the two states. 分割; 割り算, 除算; 区分, 区画; 《米国で官庁の》 部, 局. An organizational level of a company. 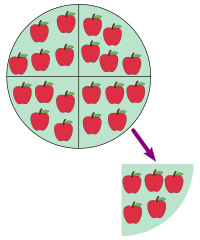 Divisions can be based on geography, (East Division, West Division); product specializations, (New Technologies Division); or any other characteristics. (arithmetic, uncountable) The process of dividing a number by another. (taxonomy) A rank below kingdom and above class, particularly used of plants or fungi, also (particularly of animals) called a phylum; a taxon at that rank. (government) A method by which a legislature is separated into groups in order to take a better estimate of vote than a voice vote. The House of Commons has voted to approve the third reading of the bill without a division. The bill will now progress to the House of Lords.